It is a beautiful sunny day and on the small elementary school’s athletic field, about 200 people have gathered to join in a “sports festival”. Many children and adults play running race, a tug of war, and KIBASEN (knights on horseback) and so on. We can see some University students and exchange students too. Many neighbors or old people from all over the area also come to the sports festival to cheer them on. During the lunch time participants enjoyed foreign country’s foods made by exchange students such as tacos, Chinese fried rice, and fresh spring roll. 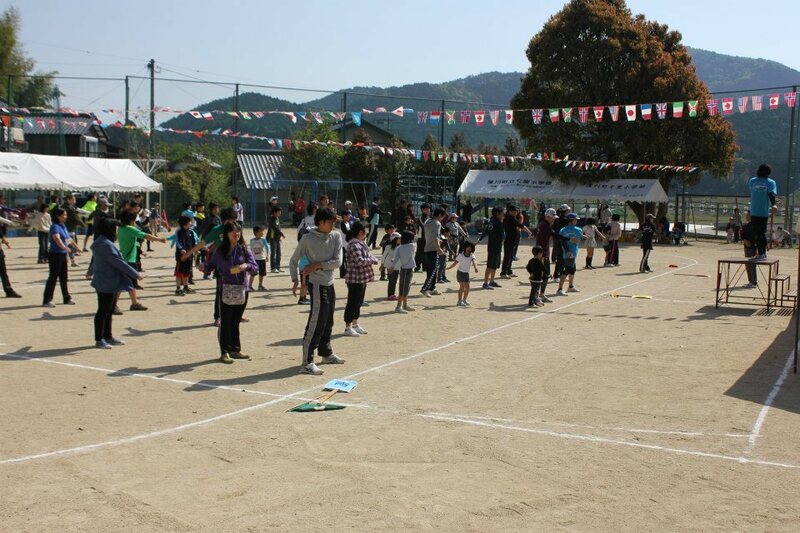 This International sports festival produced by Kochi University students in a small rural area, Nanasato in Kochi. About 1 hour from the Kochi city by car, there is a small area called Nanansato in Shimanto town. In this area there is a branch of the Shimanto River and a lot of greens such as rice field and mountains. In addition, we can spend relaxing time at a hot spring in Matsubagawa. However, this area has serious problems, aging society and declining birth rate; that is under populated. For example, the number of all students in Nanasato elementary school is under 60. In addition, because of young people get their jobs in other cities or prefectures, population of children are decreasing year by year. Usually, Sports festivals are held in schools as an event. Students are separated into teams and compete through games. However, most areas in Japan have their own regional sports festivals. People in that area get together, and make sports festivals which a variety of people can enjoy. These events play a very important role in society, because they make connections between people and build a cooperative spirit. On the other hand, these kinds of events need a lot of active people especially young people. Because of these situations, sports festival in Nanasato had disappeared for nearly 30 years. In the Kochi University, there is a student group called “KOKUSAI-TYAYA”. Their main purpose is making events which students, exchange students, and local people can communicate through. So far, they have cooking lessons, Halloween party, and making Kochi’s traditional paper. This group was established in a class of Kochi University; “Guide to International Cooperation”. In this class, students think about what they can do for International cooperation or communication. Many professors are invited to this seminar, and students make action plans. After finishing that class, some students gathered to carry out what they learned. Then, members of that group find serious under population problem in Nanasato. It was very lucky that we can meet the principal teacher in Nanasato elementary school, Mr. Sakayama. He went overseas as a volunteer, and he has deep knowledge and understanding of the international communication. 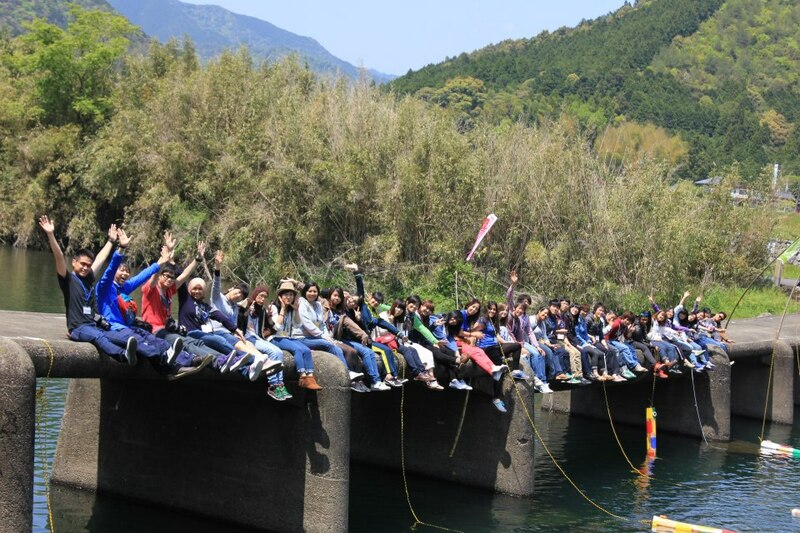 When students of KOKUSAI-TYAYA search for their field of action, they met Mr. Sakayama. First time I heard this phrase, I just wondered why people do not try to solve problems. However, after that, I found that in rural area, there in NO available acting person because of under population. As he says, in the course of making this event, they faced a lot of difficulties. For instance, when they went to an explanatory meeting for local people, several people didn’t have a good impression of this event. Of course they could understand the concept and would like to accept. Nevertheless, very few people believed this event could be successful. When we hear the word “international”, most people would image foreign people or country in a big city. However, in my opinion we can experience “international” not only in a big city but also in a small rural area. Children can get opportunities to touch foreign culture since they were young. Exchange students can have more chance to spend their time with Japanese people. Rural area people want more and more people will visit them. These demands getting together, we can find international wherever. According to the Kochi newspaper there is the same kind of case in Konan-city Kochi. About 50 years ago there were 500 people in this village, yet now there are only 7 people there. Furthermore, the average age of residents is over 80 years old. This year (in 2013), this village’s sports festival has finished because stuffs became too old and they cannot get enough financial support. Even though this village is very small, about 200 people visit there every year. It is very difficult to get support from local governors, moreover it nearly impossible to solve problems by themselves. Without this event it might be expected that the number of people who go there will become fewer. In my opinion, more and more students know about these things and try to take action. “I enjoyed it so much!“ one woman said to me after finishing the sports festival. “This experience could be a souvenir for heaven,” she said to me jokingly. This event is of course a small change in a small area. However, somehow it brings good change to people and that area. I am really looking forward to next year’s sports festival. That would be a first step of Kochi to become a truly “international” prefecture. When I was small kids I loved the sport day because I used to fast runner! now it’s not at all. It’s a nice thing to make a opportunity to meet Japanese people and foreign people. I would like to support this event. I cannot imagine a childhood without a sports festival, but there is. I can imagine this wonderful event made lots of kinds of people smile . I would like to support them through joining these events!! When is the next time?? ?